A number of projects are currently under development or have taken place in the Schaumburg area that are designed to promote biodiversity and restore some of the open land back to native prairie. In 2004, Motorola took steps to revegetate a half-mile-long wet area with native plants, converted approximately five acres of turf grass to a re-created prairie, and had plans to naturalize a 300-foot-long stream bank on its 316-acre campus. The Renaissance Schaumburg Convention Center Hotel has been selected by the U.S. Environmental Protection Agency (EPA) and Chicago Wilderness to receive a 2010 Conservation and Native Landscaping Award. The award recognizes seven and a half acres of ponds, wetlands and prairie plantings that surround the Schaumburg hotel. The native plantings that have been incorporated in the hotel grounds replace a majority of the turf grass and ornamental plants that were originally found in the area. The new plants help trap pollutants, clean storm water and reduce runoff. After the new plants established themselves in the environment, the use of herbicides was cut in half, maintenance hours were reduced by one third and water use has been reduced to only watering the limited turf grass and annual flowers found throughout the property. Guests of the Schaumburg hotel can enjoy the landscape by utilizing walkways, bridges and overlooks that surround the property’s natural areas. Another project still in its infancy but one with the potential to change the landscape of Schaumburg is Roosevelt University’s Green Campus Environmental Sustainability Initiative. Removing invasive plant species, planting ornamental native flower beds and native grasses, and resurfacing the campus parking areas with permeable pavement are among the main goals of the sustainable landscape plans. “Plans for the conversion of 70 percent of the campus turf to more sustainable native plantings are presently being reviewed by the village,” said Bill Bedrossian, owner of Bedrock Earthscapes, the firm hired to design and convert the existing Schaumburg campus landscape (Samples, 2011). 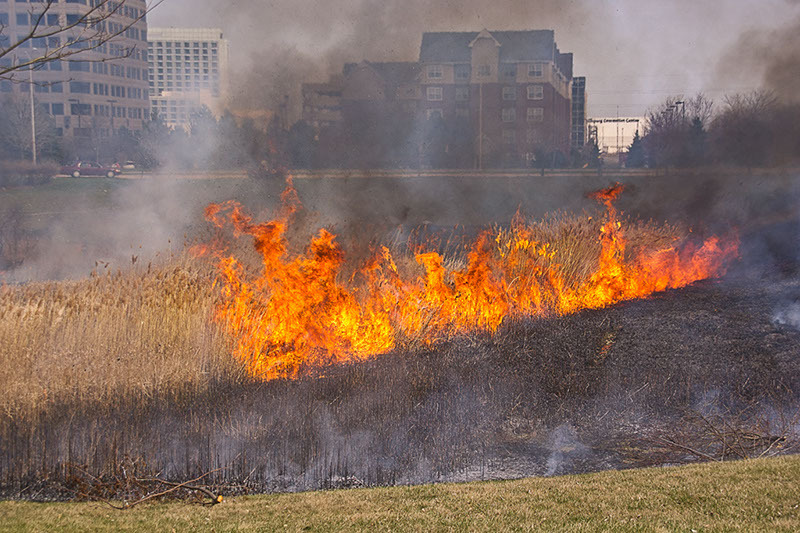 The project kicked off in early April with a controlled burn of a detention area in the northwest corner of the campus. With the aforementioned projects, Schaumburg is positioning itself to be a role model and leader in the development of sustainable communities. Its focus on establishing biodiversity in the limited amount of open space that still exists and prompting businesses to do the same will ensure Schaumburg remains not only an edge city within the Chicago metropolitan area, but a leading-edge city.